Plan the adventure of a lifetime with this colorful 97-page guide. It's yours FREE when you sign up for our FREE newsletter. We'll never sell, rent, or share your email address. We'll use it only to send you Road Trip Ready. If you want to take a road trip for the sheer love of it—or even if you have to take a long drive and you're just looking for a way to make it more fun—the Road Trip Planning Guide is for you. How to identify—and then work around—your road trip limitations (page 7). Our foolproof trick for breaking a long drive into manageable days (page 10). Three easy ways to select your road trip destination (page 12). Which 11 road trip essentials you won't want to forget (page 24). How to keep the kids happily occupied in the car (page 27). Creative ways to capture your road trip memories (page 47). How to check your car maintenance before starting out (page 52). Every page of the Road Trip Planning Guide delivers practical, helpful information written in everyday language. We've also included our own photos from out on the open road to inspire you in your road trip vacation planning. How to keep the grownups entertained with weird road trip games (page 31). Which special stop always makes us feel like we're truly taking a road trip (page 40). What never to eat on a road trip (page 73). Some fresh alternatives to your usual road trip music (page 76). Why hypermiling may be just what you need to save gas (page 83). The simple mistake too many drivers make when they're pulled over by a cop (page 91). Why recovering from a road trip is a process that begins before you leave (page 94). You'll get these tips and more when you download your copy of the Road Trip Planning Guide today. We believe—and we hope you'll agree—that the Road Trip Planning Guide gives you road trip advice you won't find elsewhere. A lot of it. But we also want to leave you plenty of cash for actually taking your next journey. So we're not going to charge $59, $39, or even $19 for this in-depth guide. We’re offering the Road Trip Planning Guide FREE to road warriors like you who sign up for the Road Trip Ready newsletter, which is also FREE. Yes, you’ll get something FREE when you sign up for something FREE. We hope that sounds like a great deal. There’s absolutely no catch—we just want to share our tips, tricks, and experiences with as many road trippers as possible. So, what are you waiting for? 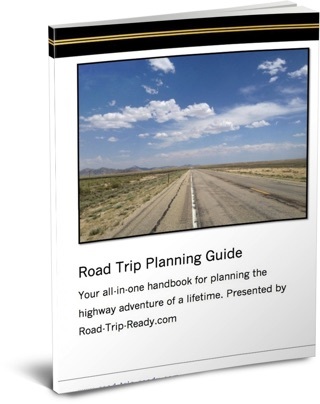 Sign up for Road Trip Ready now, and get your FREE copy of the Road Trip Planning Guide.